For almost one hundred and fifty years, baseball teams around the United States have used collectible items to recognize and honor those playing the game. From Little Leagues across the country to Major League Baseball, such items as trading cards, pins, pennants and more have been distributed, collected, traded, and sold by kids and avid adult collectors. In the last few years, challenge coins have grown increasingly popular among Little League teams due to their customizability and collectability. Baseball challenge coins can be customized to feature team slogans and logos, photos, and even player numbers. The potential design ideas are limitless, and they can vary in shape and size. Their durability and form factor make them a logical choice for little leagues, as they don’t have to worry about creasing them, or being pricked by a sharp point. Customized baseball challenge coins are starting to pop up in Major League Baseball stadiums around the country as well, further fueling their popularity at the Little League level. Aspiring baseball superstars eager to have some sort of connection to their favorite Major League Baseball team love the idea of having a customized challenge coin for their own Little League team. Challenge coins have been used for decades in the military to build morale and unity among units. Similar to the manner in which they been used at the military level, Little League baseball teams have used them to symbolize team solidarity. 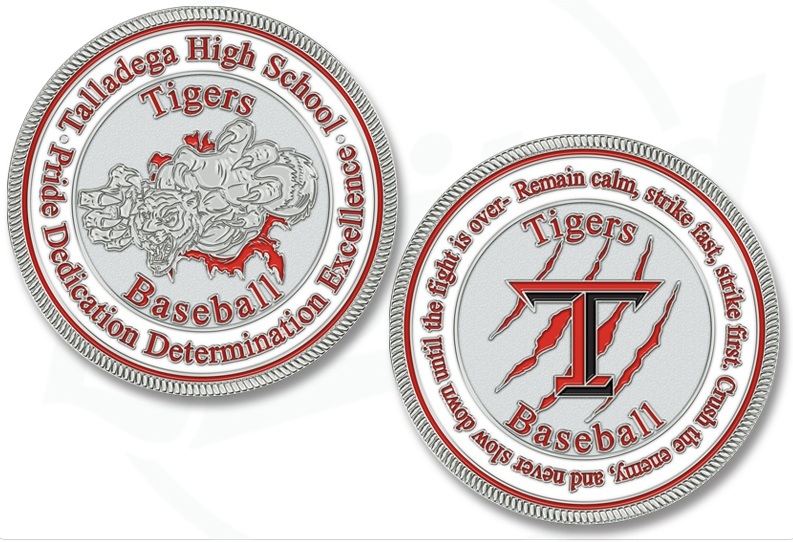 Each member of a team is given a baseball challenge coin with the team logo, slogan, or some other unifying image or text. 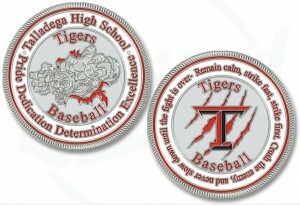 Some teams require their players to have their team’s baseball challenge coins with them at all times to represent their commitment to their team. Others, however, allow their players to display the coins as they see fit, and even trade them with members of other teams. In fact, the trading of baseball challenge coins has become so popular that many Little League teams issue each player more than one coin to make such exchanges possible. 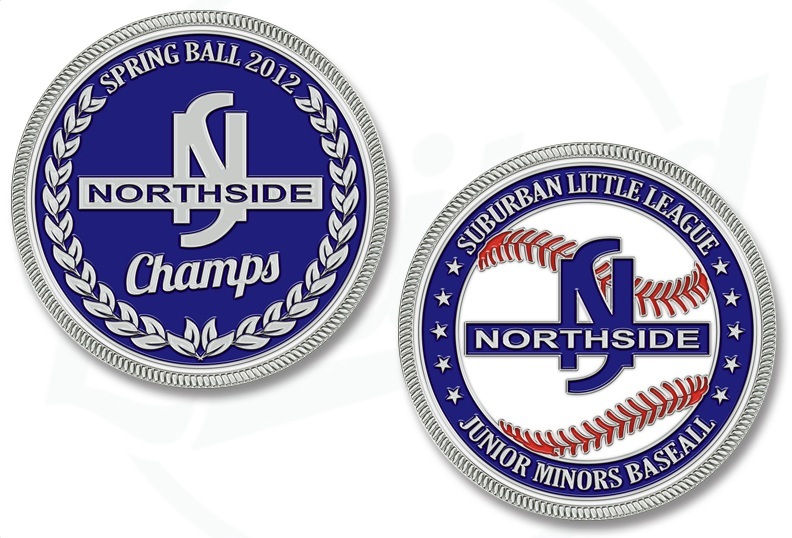 Many Little Leagues around the country are even replacing the traditional trophies and certificates with baseball challenge coins as a way of honoring the league champions, or simply all of those that participated for the year. While trophies are clunky, and can take up a lot of space when displayed, baseball challenge coins are made to a convenient and easily displayed size and shape. Because baseball challenges are customizable in nearly every aspect, they make for the perfect keepsake to meaningfully honor championship teams. •	The number of coins you will need to order. •	The size and shape of the coin. •	The design of the coin. •	How are the coins going to be used? To honor a championship team or superstar player? Or to be given out for to each player in the league or on a team as a token of participation? •	How many baseball challenge coins will each player receive? Will the players be given just one for keepsake purposes, or will they be given multiples and encouraged to trade? After you have decided the perfect quantity for your order, you’ll then want to decide what size and shape you would like for the coin. Baseball challenge coins are commonly round in shape so as to maintain the same form factor as a ball. The size that you choose, however, will depend on the design that you would like your coin to feature. When choosing a design for your baseball challenge coins, you’ll likely first want to get an idea as to how the coin will be used. If the coins will be given to the championship team in some kind of ceremonial fashion, you wish to have a design and text that reflects their accomplishment. On the other hand, if the coin is to be used as a means of building team solidarity, you may want to include the team logo and slogan in the design. This entry was posted by CCL. Bookmark the permalink.